Right now, Miss Virginia is growing and learning things at a very rapid rate. 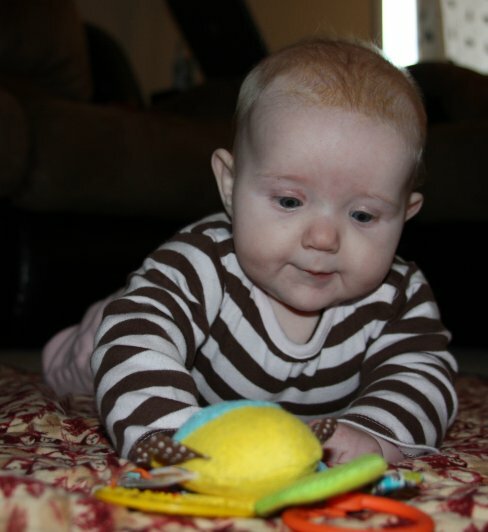 She recently had her 4 month check up and measured an amazing 27″ long .. that’s 7 inches since birth and it puts her above the 100th percentile for her age. She weighs almost 17 lbs (above 90th percentile). All of that growth has been fueled by breastmilk (some have suggested Wendy spikes it with Miracle Grow). Auntie Dawn tried to tempt her with punkin pie and whipped cream during the Thanksgiving Holiday, but she’s gonna stick with the high octane fuel for now. When she was younger, a few months ago, her best friends were lights. She’d stare up at the ceiling, cooing and smiling, flirting away at the light fixture. Since then Virginia’s discovered that people are also fun to flirt with, she’s learned to smile and laugh and get excited to match the mood of those she’s with. 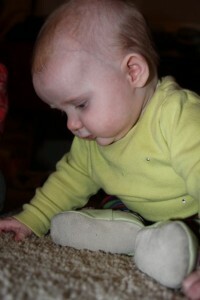 Over the last few weeks, she’s learned that her hands can do more than just flail around randomly. At first she needed to use both hands in order to get one of them into her mouth. She’s now a pro at one-handed, unassisted finger sucking. Not content to rest on her laurels, she quickly progressed in the Grabbing Things category, discovering that she can get her hands to bring other things to her mouth for analysis. This has opened up a whole new world for her and we’re introducing toys little by little. 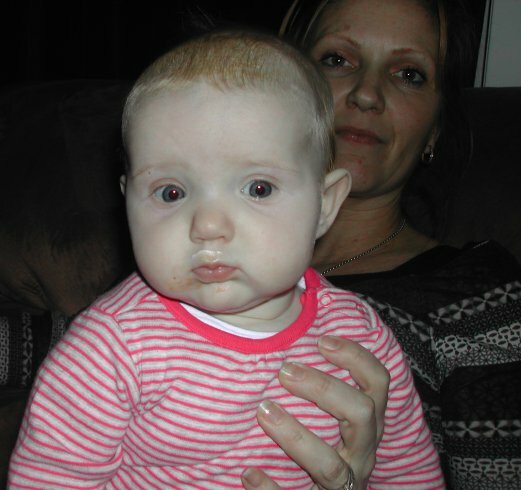 Speaking of flailing, Virginia used to practice her swimming strokes — with one hand — while nursing. when on her left side, would breast stroke with her right arm, when on the other side she was doing freestyle. That progressed to doing freestyle with both arms and now she just pets Wendy or holds onto her shirt. She’s also very close to being able to sit up on her own, so we’re giving her time in the boppy. That allows her to work on it without completely falling over everytime. Her core body strength is impressive and she’s able to pull herself from an incline into a full sitting position or from a seated forward fold. Her legs are also very strong, with a little balancing help, she can stand for a long time and really enjoys showing what a big girl she is. down…. and UP! from wendy morissette on Vimeo. We’re having so much fun watching her discover more and more of the world around her. For a while, her very best friends were her feet, watching her ‘discover’ her feet and play with them. She smiles and giggles and looks around to see if we’ve noticed how clever she is. At about the same time she figured out she could use her hands to grab things. Along with objects that can be grabbed, she’s paying more and more attention to what we’re doing, especially when we’re eating and drinking. The look of intense curiosity on her face as she tracks each bite and drink is hilarious and endearing. The soda cans are always mesmerizing, however, whether we’re drinking or not. Sometimes she’ll just be staring, transfixed, at a shiny, shiny Diet Coke as if waiting for it to move on its own, or start talking to her. 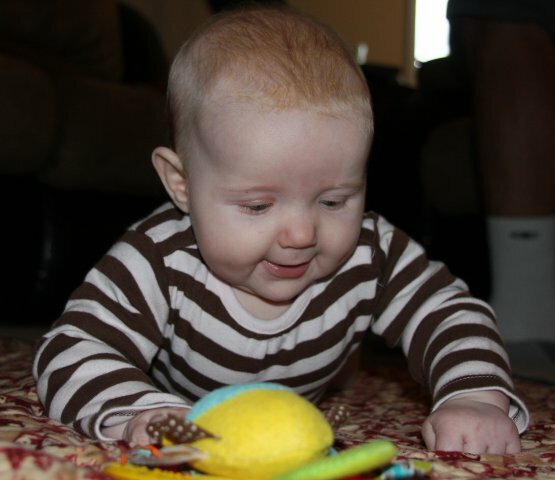 We don’t know how much time we have until Virginia can roll/crawl across the floor , but she’s beginning to figure out some of the basics. 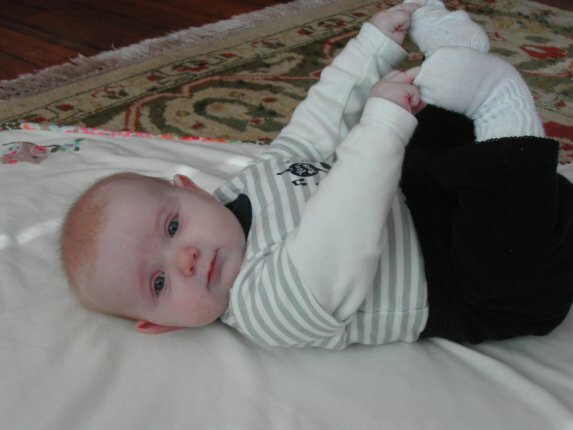 She rolls from side to side with her feet in her hands (classic happy baby pose) and does a reverse inch worm – arching her back and moving slowly away from her original position. We’ve watched her do a combination of those motions and go in a complete circle, with her head as the center point.